Here we provide information on available data and mapping of present-day climate for coastal regions around Australia, including links to where the data can be accessed. There is a considerable amount of data and mapping of present-day climate available for coastal regions around Australia, spanning terrestrial and oceanic climate variables and extreme weather. Much of this is available through the Bureau of Meteorology website. State Governments also have important information on offshore waves and tides. Geoscience Australia and the Cooperative Research Centre for Spatial Information are making available information on hazards including catchment flooding and coastal inundation mapping. Expert guidance is useful for interpreting a number of these datasets, for example to ensure that record lengths are sufficient to meet end-user needs (too short a record length will not be representative), or to provide explanations of why the observed variability and trends may be occurring. Where can I access data on the current climate? The Bureau of Meteorology (BoM) collects extensive data on climate across Australia, including from nearly 800 temperature recording sites, and more than 6000 rain gauges across the continent and in remote Australian territories. Many of these data are readily accessible online, in both raw and interpreted (such as averaged or mapped) forms. The BoM and State and Territory Governments also collect and make available data on the near-shore oceanic climate. extreme weather events relevant to the coast (Table 3). Daily and monthly temperature data. Monthly mean maximum and minimum, and highest and lowest temperatures. Data can be searched by text or map to view historical weather observations, statistics, graphs and data for each weather station. The number of years of climate record is also provided in each search. Daily and monthly rainfall data. Information about maximum wind gusts, as well as mean 9am and 3pm wind speeds, is provided for each available weather station site. Getting data involves the following steps. Finding weather stations that collect that type of data, near the locality you are interested in. Be aware that data are collected by a range of weather stations and some stations, for example, may only collect rainfall data. Choosing the map or text tool to select data. The map tool shows locations on the map, allowing the user to navigate around the map to pick locations, and it displays mapped data, for example average rainfall maps. The text tool may be more practical for slow internet connections and for people who do not use a mouse. It also provides a direct process if a user regularly wants data for the same location. BoM can also provide additional data beyond that available through Climate Data Online. Note that a charge may be associated with the service. The Australian Baseline Sea Level Monitoring Project, managed by the Bureau of Meteorology, delivers hourly and monthly sea level data and statistics. State and territory tide gauge metadata and observed monthly sea levels and statistics can be used to generate local historical sea levels. State government agencies collect and make available offshore ocean wave data from wave buoys at select locations including wave height, period and direction. Modern buoys continuously record data. The Bureau of Meteorology also manages two wave buoys, at Cape du Couedic (South Australia) and Cape Sorrell (Tasmania). Extensive information on wave climatology including height, direction and energy on annual and monthly timescales (data are listed in the link under the title ‘renewable energy’). Daily data on low and high tides available for sites around the coast with tide gauges. Daily maps of sea surface temperatures around the Australian coastline, and global maps of differences in sea surface temperatures over last month and three months. While a range of data can be accessed from the BoM website, note that caution is required in any extrapolation from short-term records, and that any apparent trends need to be considered in the context of the drivers of climate variability (see National mapping). The Bureau of Meteorology provides information on previous tropical cyclones and tropical cyclone climatology. The Bureau of Meteorology has data on East Coast Lows from around 1950 to 2008, including information on central pressure, location, rainfall and wind intensity, and ocean variables (water level, wave height and power). The Bureau of Meteorology provides a range of data and information on floods including rainfall data, river height data, and flood classification and warning products. Probable Maximum Precipitation (PMP) estimates for the design of large dams and for use in floodplain management. Where can I access maps and visualisations of current climate? Raw data on present climate are often difficult to use and interpret, due to factors such as large variability over space and time. To assist with interpretation, the BoM, state governments and Geoscience Australia provide information about characteristics and use of the data, and mapping and visualisation products targeted to a wide range of end-users. Table 4 provides links to key mapping and visualisation products for the present climate. For further information on available datasets see Information Manual 3: Available Datasets. What maps and visualisations are available? Maps of recent and average climate are available through the Bureau of Meteorology website. The Climate Change in Australia website and technical reports have maps of average, extreme and trends in climate variables. Wind roses provide a frequency analysis of wind direction, which reflects the variability of wind. These maps show the average monthly wind velocity distribution across Australia. The data are generated by a computer model, informed by data from ground stations, upper air observations, satellites, ships and buoys. 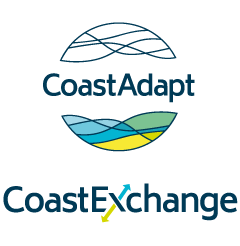 Coastal Risk Australia is an interactive tool that allows users to explore coastal flooding under current (and future) tide and extreme water level conditions. It has been developed by the CRC for Spatial Information. The Bureau of Meteorology operates a 7-day global wave model called Auswave. Wave forecast maps are available for a number of sub-regions of Australian waters using the high resolution Auswave regional model. The Water Observations from Space tool managed by Geoscience Australia enables users to identify areas that have been inundated in the period of quality satellite observations.